march 2015 / the tasting panel / 1 1 1 WINE LEGACIES Concannon Vineyard 2013 Cabernet Sauvignon, Paso Robles ($18) Bright red color and fresh, effusive, on-the-money blackcurrant aroma with the classic cassis perfume, tinged by subtle herby/minty nuances and a light, toasty oak veneer. On the palate, medium-full (just 13.5% alcohol), slightly meaty, yet rounded, smooth feel, with mild, perky natural acidity playing up the bright, perfumed varietal fruit. Delicious value. Concannon Vineyard 2009 Heritage Cabernet Sauvignon, Livermore Valley/San Francisco Bay ($60) Just because they can, Mr. Concannon showed off this limited bottling, which is flush with varietal fruit qualities tucked into a velvet textured medium-full body (14.2% alcohol); lavish touches of mint chocolate and cigar box, traces of herbal leafiness and a firm core of tannin filling out a fleshy, accessible feel. Concannon Vineyard 2011 Mother Vine Cabernet Sauvignon, Livermore Valley/San Francisco Bay ($40) Sold only at the winery, this rare bottling is crafted from the Cabernet vines propagated from their his- toric 1893 Château Margaux vines grown in the Mother Vine Vineyard. Here, the sweet blackcurrant is merged with green peppery varietal aromas; in Concannon's consistent house style, the body is moderate in weight, yet gives a broad, rounded feel and finish. 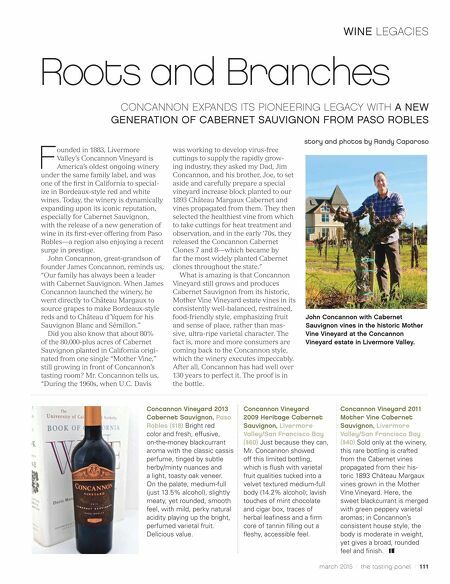 Roots and Branches CONCANNON EXPANDS ITS PIONEERING LEGACY WITH A NEW GENERATION OF CABERNET SAUVIGNON FROM PASO ROBLES story and photos by Randy Caparoso John Concannon with Cabernet Sauvignon vines in the historic Mother Vine Vineyard at the Concannon Vineyard estate in Livermore Valley. F ounded in 1883, Livermore Valley's Concannon Vineyard is America's oldest ongoing winery under the same family label, and was one of the first in California to special- ize in Bordeaux-style red and white wines. Today, the winery is dynamically expanding upon its iconic reputation, especially for Cabernet Sauvignon, with the release of a new generation of wine in its first-ever offering from Paso Robles—a region also enjoying a recent surge in prestige. John Concannon, great-grandson of founder James Concannon, reminds us, "Our family has always been a leader with Cabernet Sauvignon. 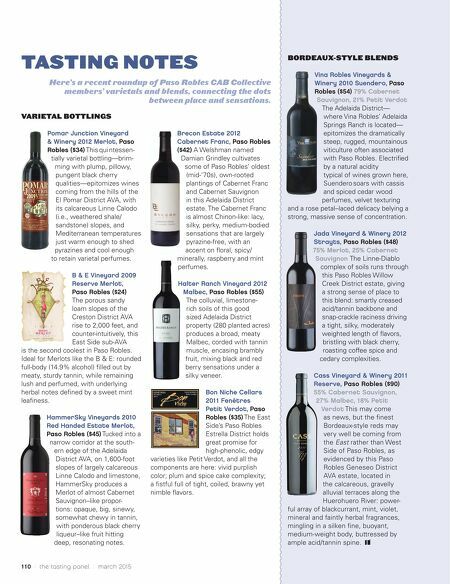 When James Concannon launched the winery, he went directly to Château Margaux to source grapes to make Bordeaux-style reds and to Château d'Yquem for his Sauvignon Blanc and Sémillon." Did you also know that about 80% of the 80,000-plus acres of Cabernet Sauvignon planted in California origi- nated from one single "Mother Vine," still growing in front of Concannon's tasting room? Mr. Concannon tells us, "During the 1960s, when U.C. Davis was working to develop virus-free cuttings to supply the rapidly grow- ing industry, they asked my Dad, Jim Concannon, and his brother, Joe, to set aside and carefully prepare a special vineyard increase block planted to our 1893 Château Margaux Cabernet and vines propagated from them. They then selected the healthiest vine from which to take cuttings for heat treatment and observation, and in the early '70s, they released the Concannon Cabernet Clones 7 and 8—which became by far the most widely planted Cabernet clones throughout the state." What is amazing is that Concannon Vineyard still grows and produces Cabernet Sauvignon from its historic, Mother Vine Vineyard estate vines in its consistently well-balanced, restrained, food-friendly style, emphasizing fruit and sense of place, rather than mas- sive, ultra-ripe varietal character. The fact is, more and more consumers are coming back to the Concannon style, which the winery executes impeccably. After all, Concannon has had well over 130 years to perfect it. The proof is in the bottle.